Integrate a graphic clock with your Windows desktop and configure it with a library of digital and analog clock styles. Set your system clock to an atomic time standard. Also includes a reminders, world time clock, countdown clock and stop watch. Build distributable, multimedia Windows screen savers of your family, your corporate logo, product advertisements, themes or your most inventive fantasies. Display just about anything you can imagine with your choice of pictures, sounds and text. Build distributable, self-displaying, interactive multimedia slide shows, photo albums, brochures, advertisements and portfolios that display on Windows systems. Transform your pictures, sounds, animations and ideas into professional presentations. Xbase RS232/RS422/RS485 serial communications software. Control multiple ports simultaneously. Includes line status/control, modem control, ANSI emulation, virtual ports (USB to serial,Bluetooth serial), hardware/software flow control. Visual Basic RS232/RS422/RS485 serial communications software. Control multiple ports simultaneously.Includes line status/control, modem control, ANSI emulation, virtual ports (USB to serial,Bluetooth serial), hardware/software flow control. Power Basic RS232/RS422/RS485 serial communications software. Control multiple ports simultaneously. Includes line status/control, modem control, ANSI emulation, virtual ports (USB to serial,Bluetooth serial), hardware/software flow control. FoxPro RS232/RS422/RS485 serial communications software. Control multiple ports simultaneously. Includes line status/control, modem control, ANSI emulation, virtual ports (USB to serial,Bluetooth serial), hardware/software flow control. AMC e-Paint embodies robust painting functionality. It features a variety of selection tools; antialiased drawing and text; a gallery of image processing filters; multiple document handling; soft brushes; undo; variable magnification and lots more. ePlayer is a best and free Android Emulator for pc that enables all Android games and apps to run smoothly in Windows systems. It built on x86 Architecture, support advanced features like OpenGL & hardware acceleration, run faster, more stability and compatibility than other Android Emulators. XePlayer Android Emulator for pc support video recording, gamepad & keyboard, and internal integrated Google Play store to compatible with all apps, more than 99% apps & games Running perfect on XePlayer.XePlayer Android Emulator is downloadable for Windows 7,8,10,xp and Laptop.Download XePlayer Android Emulator on PC and Start to playing games / apps now! Salient Features of XePlayer:XePlayer is very quick and the emulator never freezes.You can see the highest performance with Xeplayer emulator.This Xeplayer is designed based on Android 4.4.2 Kernel and it is compatible with X86 and AMD.The response speed of Xeplayer android emulator is really quick and very stable.You can see Best Game Experience with Xeplayer. 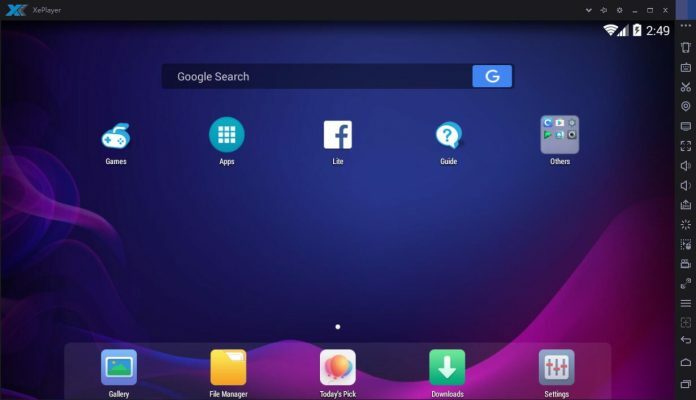 This is really a great android emulator to play all kinds of games on this emulator.You can see File Manager, Facebook Lite, Camera apps are already installed.Shaking features is also available in this emulator.Google Play Store and Browser is also available on Xeplayer emulator.Download Xeplayer Android Emulator For PC now! Transform your HTML5 site to an Android App. Convert your HTML, CSS, JS, Web URL or any Web Content directly to an Android App. Send Push Notifications.